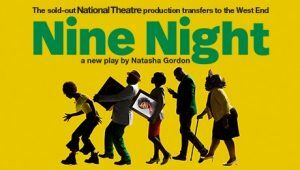 An observation of a family dealing with the aftermath of the passing of a loved one, Nine Night brings to light the Caribbean tradition of ‘Nine Nights’ – an extended wake, mainly practiced in Belize, Grenada, Dominica, Barbados, Jamaica, Guyana, Trinidad, Haiti and the Dominican Republic. A celebration of life, the following days consists of ‘food, music and sharing stories’. We’ve teamed up with the Nine Night team to giveaway a pair of tickets to a performance of your choosing between Monday and Thursday. What award did playwright Natasha Gordon win for her show? For your chance to win, send an email titled ‘Nine Night Giveaway’ along with your answer and name to theatrefullstop@gmail.com. The deadline for this competition is Friday 21st December 2018. Good luck!